An effective playbook is not an "objection book" in disguise, nor is it a glorified documentation of your sales process (or marketing approach). 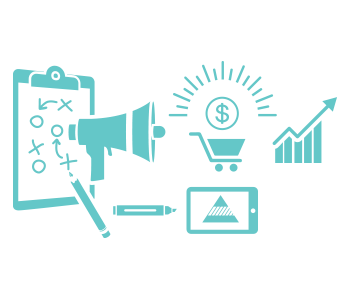 A playbook, and the "plays" within it, organize and align the actions of multiple parties, through multiple phases of your demand and revenue generation approach. So, if only your salespeople are using your sales playbook, or the marketing department is the only one referring to the inbound marketing playbook, then it is unlikely the playbook is going to be effective. Football is common metaphor used to describe the value of playbooks and in this case it's a good one. Effective playbooks, combined with the talent and practice to execute them, enable a diverse group of people with different talents and approaches to adjust and move as one unit...even after the unexpected happens. The same is true for an effective business playbook. Playbooks increase execution velocity because you're able to automate a higher percentage of the process and you require less direct communication to execute the portion that isn't automated. In the "old days," once a lead/prospect was being actively managed by a salesperson, the typical MO was for marketing to stay the, uhm, heck out of it. I remember being a salesperson yelling at my boss to tell marketing to stop sending things to my prospects because, "they're getting in the way." That approach worked (kind of) in the past. Today, you can't afford such an approach if scaling growth is an objective. Multiple people in multiple roles must work together to generate more revenue, and playbooks make that possible. Earlier today I was talking with a fellow sales executive and believer in playbooks and my philosophy behind their execution. I'm a firm believer that playbooks should be put into use long before they're complete. I want sales reps and marketers to be using the playbook before the plays are complete. How can this be, you may be asking? 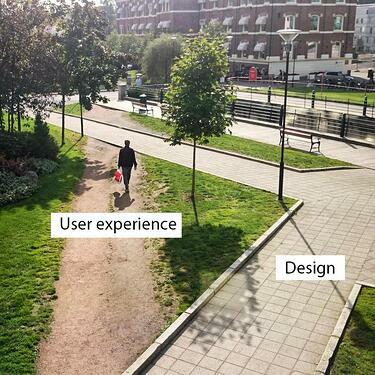 Well, as one of my favorite images shows, there can be quite a difference between "design" and "user experience." Too many processes and playbooks are built in a laboratory. They're elegant, well written and designed...and they're immediately "filed" and ignored. One of the primary benefits of a purposeful playbook is that it makes iterating and continuous improvement possible. While the initial playbook design may be based upon experience and industry best practices, data is the key element to guide future enhancements. Not only should key metrics be a core part of every playbook, attention should be paid to the metrics and analytics that will be used to track, manage and assess all aspects of the playbook. 5. It Builds a "Learning Organization"
In 1990, author and Sloan Business School Professor, Peter Senge popularized the term learning organization, which he defined as a company that facilitates the learning of its members and continuously transforms itself. A playbook should make the interchange of information and insights easier and faster. It should also support ongoing experimentation and make the exchange of experiences as seamless as possible. In today's complex world the organization that learns the fastest has a distinct advantage. One of the most common shortcomings that I see in playbooks is that they only focus on process. They're great at documenting stages and laying out question/inquiry tracks. However, that's also where they end. A major reason they enhance performance is because they enable performers to focus more on their performance, instead of remembering everything they're supposed to do, or where everything is. It also highlights training and support materials in context. This is especially beneficial when ramping up new sales reps, but it's also quite valuable for experienced reps. I regularly work/train on issues that I know well, but need to get better at; and I coach experienced reps in much the same way. Integrating and aligning training and support materials with the context of the process increases the effectiveness of all parts of your go-to-market process. It you haven't made (at least) a tweak within (at most) the last month, then it's a pretty good bet your playbook isn't being used effectively and it's quickly losing it's relevance. Playbooks decay. Imagine if a football team created their playbook at training camp and didn't change it at all during the season. I can't imagine that team would win a lot of games. You must build in feedback systems and utilize data to assess progress. Be sure that your playbook builds in tests and experiments so that it stays fresh and ensures that you're always improving. Remember, whether your playbook is documented or not, it's your playbook. Be sure that it meets these seven criteria, and you'll find the momentum you need to drive through your objectives.